Whatevs. It’s an outdoor game. It’s always fun to watch. This will be the second Winter Classic for both teams, and the first for Buffalo since the inaugural Winter Classic back in 2008. And last week, both teams unveiled what they’ll be wearing, so let’s get to it, starting with the road home team. 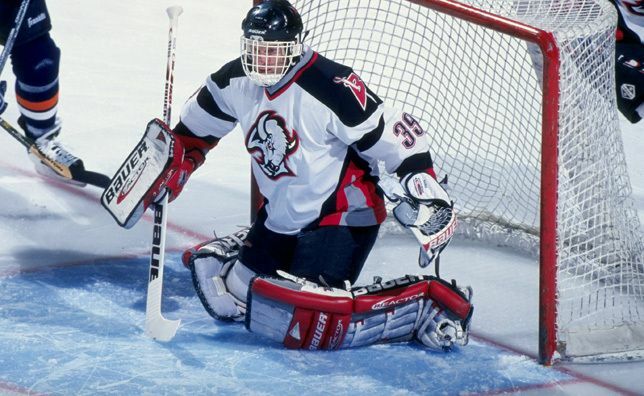 The Sabres haven’t looked this good since their last Winter Classic appearance, back when they were wearing the Buffaslug after years of wearing their dismembered buffalo head jerseys. 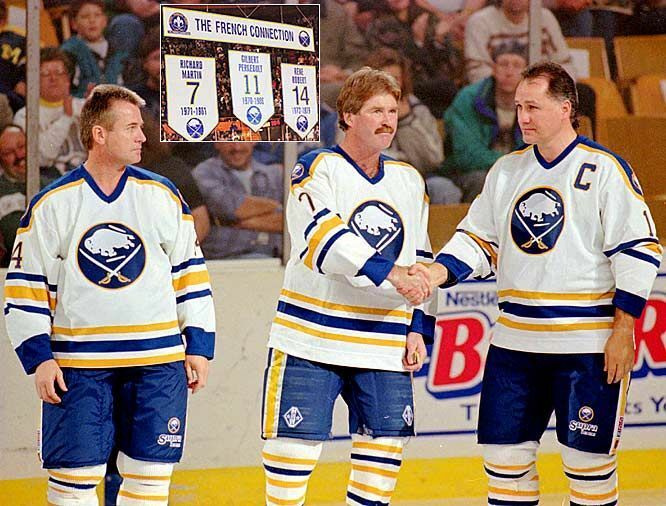 With Sabres fans so starved for their team to wear something not terrible, it lead to them bringing back their original jerseys full-time, albeit in a darker navy blue, and with superfluous grey everywhere. And you know what? These jerseys are better than any of those. And it’s not even particularly close. Ditching the navy blue of their current jerseys in favour of the classic royal blue helps set these jerseys apart. The problem with navy blue is that it doesn’t always even look like blue, but closer to black. 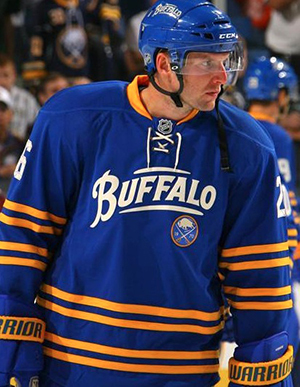 Visually speaking, a navy (slash black) jersey on white ice against a team wearing white isn’t very appealing, so the Sabres going back to their classic blue guarantees a better look on the ice already. 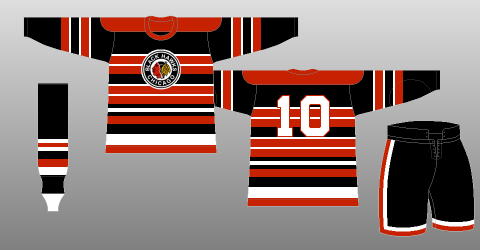 Getting rid of all those unnecessary grey stripes doesn’t hurt at all either, making for a cleaner and iconic jersey. The best feature, however, of these jerseys are the stripes. 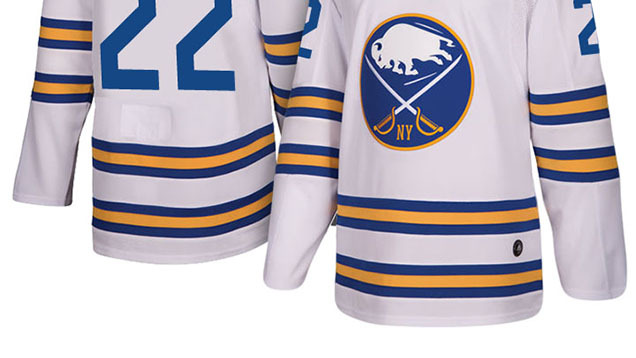 The classic Sabres jersey has always had the blue-yellow-blue striping pattern, but there’s always been white stripes in-between a single set of stripes. These jerseys those white stripes out and instead doubled-down on a second blue-yellow-blue pattern. 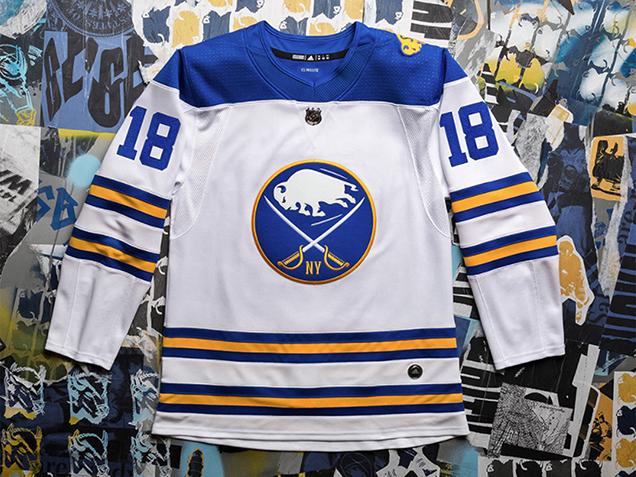 What’s cool about this is that it creates something totally unique to Sabres jerseys, and yet feels so incredibly familiar. 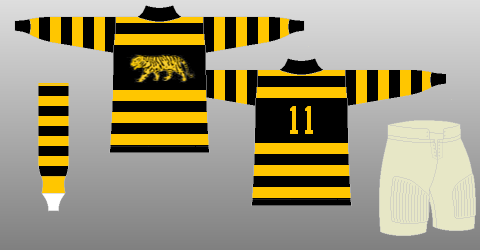 Their 2010–12 third jerseys come the closest, with a double set of double-yellow stripes, so there is some precedent within their jersey library, but these go beyond that by incorporating even more colour that works to really intensify the colours of the jersey. There’s also the historical angle, and the Winter Classic jerseys usually veers towards more historical aesthetics to celebrate the legacy of the sport. If you look at jerseys from the early days of the NHL, there are stripes. Everywhere. Like, everywhere. And these fit that visual vibe while not going crazy. The jersey designers smartly balanced the comparative multitude of stripes by leaving the rest of the jersey remarkably simple. There’s no stripes around the letters, there’s no stripes around the numbers, there’s no stripes along with shoulder yokes (which their original jerseys had). It’s simple, clean, and classic. And it balances the business of the stripes perfectly. The only beef is that they seemed to force the straight lines of the shoulder yokes into the hemlines of the new Adizero jerseys around the front of the collar. I think the straight-edge works better overall…but just don’t look too closely at it. But the top half of the jersey isn’t totally devoid of anything of interest. The new alternate logo that they’ve introduced for this jersey is fantastic. It’s a great example of modern retro design in sports, reminding me of those old baseball logos – which were quirky af and had tons of character to them – but again, not going too crazy. The customized typography placed on the classic buffalo design gives the logo charisma and simplicity. It’s seriously great and works well as a shoulder patch to add some colour to the solid blue shoulder yoke. 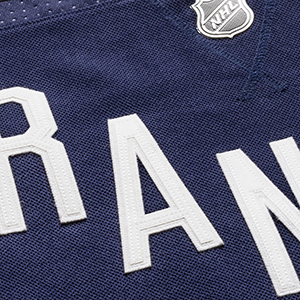 As for adding the “NY” to the main logo on the chest…cool, whatevs. It’s not major and I don’t think it adds anything really of value at all, but it’s a simple change to their logo to commemorate the Winter Classic. Fantastic. It brings in some classic hockey jerseys aesthetics with a modern twist, which perfectly commemorates what the Winter Classic is all about. 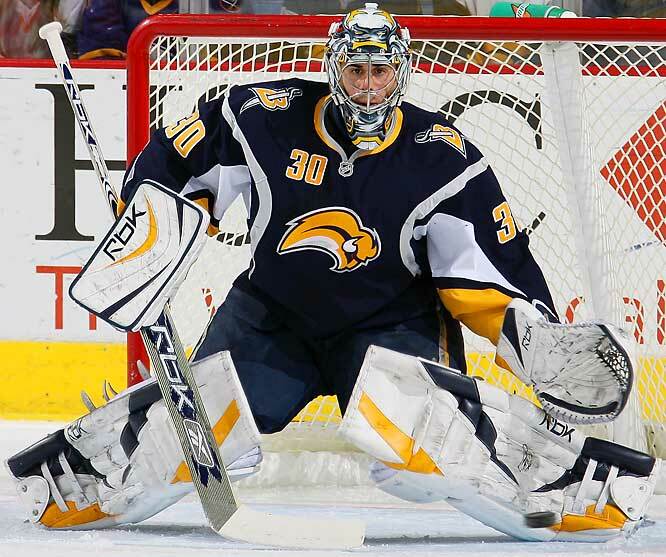 It could be the best jersey that the Sabres have ever worn. Everything they did right with the Sabres jersey, they got right with the Rangers jerseys as well. 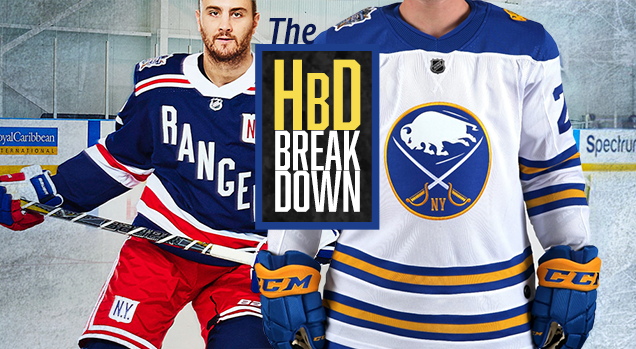 They the modern aesthetics mixed with historical aesthetics that give an even stronger faux-retro look than the Sabres’ jerseys. 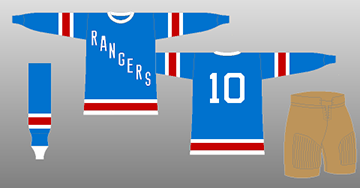 The closest comparison to jerseys that they’ve worn in the past is the 1926–27 jerseys from their inaugural NHL season. It has the same striping patterns, but the element that ties it the closest to their original jerseys is the typography: a white condensed sans serif in their traditional sloped style. The very next season they switched to red letters, and it hasn’t changed since…until now! I would’ve preferred they go with their more traditional royal blue rather than the darker navy blue (for the same reasons mentioned above). The sky blue from their inaugural jerseys is pretty bright so maybe it doesn’t have to go to that extreme. But, the non-royal blue is actually less of an issue here because of the other elements on the jersey. The darker navy blue adds a little more contrast to the bold amounts of white and red stripes, giving them more impact and vibrancy. And damn, those stripes actually look really good. Their boldness and thickness reminds me of vintage hockey jerseys where stripes were sometimes the *only* feature on the jerseys. 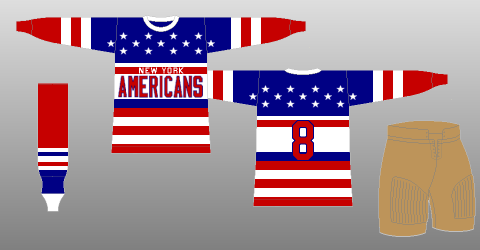 It also somehow reminds me of those old NY Americans jerseys, but obvious not as crazy. 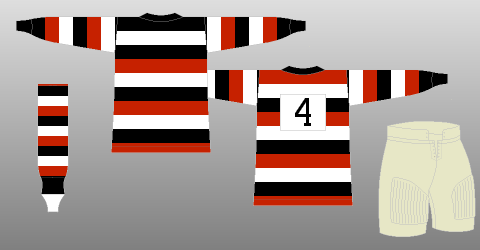 The finishing touch – and key differentiator from their inaugural jerseys – is adding their trademark red and white stripes at the shoulders which bumps up the intensity. 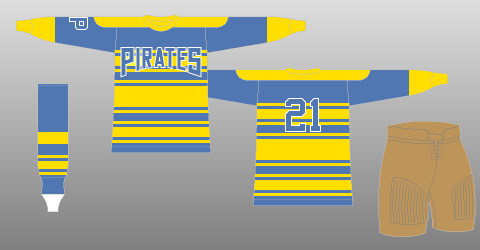 Like the Sabres, these jerseys look good because they push the envelope just enough to give it a historical touch without going completely overboard. It can be a delicate balance. 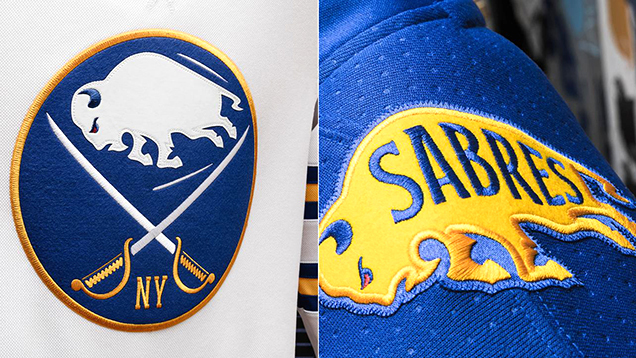 And like the Sabres, the heavy bold stripes are balanced by the relatively simple letters and numbers on the jerseys, using the standard cut-cornered sans serif that’s very common in sports jerseys. But these also have a lot more character than your standard sports jerseys by using a unique condensed version that looks pretty authentic to their inaugural jerseys. 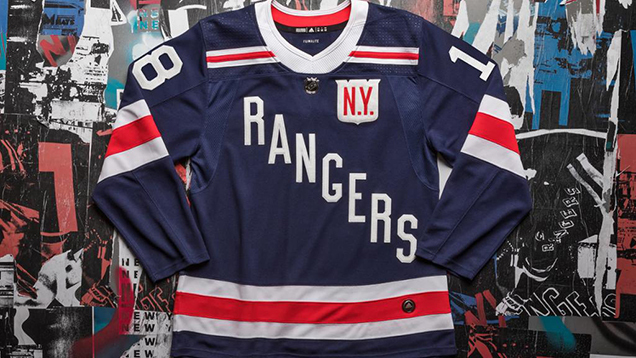 But it’s also the lack of outlines around the numbers and letters (also authentic to their inaugural jerseys) that give a much needed element of simplicity to the jerseys, just toning down the stripes everywhere else. It’s really great. And the details on those letters that you can see in the included image…so nice! Those are the kind of details that make owning and collecting jerseys so fulfilling because it’s something you would never notice when watching the games on a screen, or in-person. It’s these details – almost easter eggs – that can really elevate a jersey. 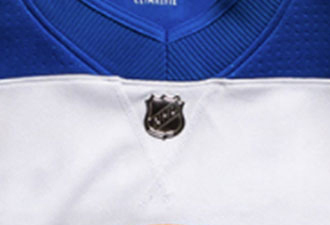 The final element on the jersey is the alternate “N.Y.” logo on the upper corner of the jersey. For me, this is the only real mis-step on the jersey, bringing in an element that doesn’t add anything other than extra noise. If you remove the patch altogether, it makes the jersey better. Also, as a personal pet peeve, I much prefer Buffalo’s approach of not including the dots (“NY”, not “N.Y.”) because again, it extra noise that doesn’t need to be there. Seems unimportant, but it’s very important…to me. I love that patch as a holder for the captaincy “C” and “A”s – and the felting and stitching are really great – but including it on every jersey is completely unnecessary. Fantastic. It blends both modern and traditional aesthetics really well while infusing the jersey with lots of character and intensity. It’s unique, it’s bold, it looks great, and it just needs to lose that chest patch. It’s easily superior to their previous Winter Classic jersey, and that was a pretty nice one too. 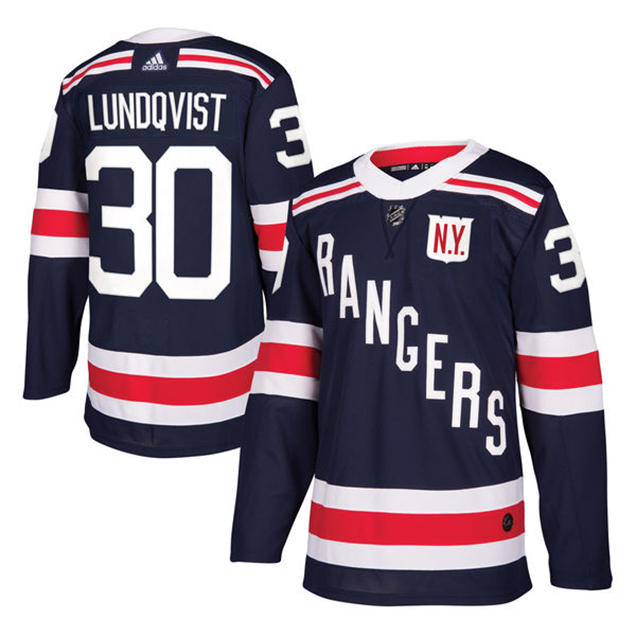 Hopefully these will be the alternate shirts going forward for the Rangers next season. I’ve always thought they should have incorporated the shoulder stripes into the home blue jerseys. Nice evals. Agreed almost all around. 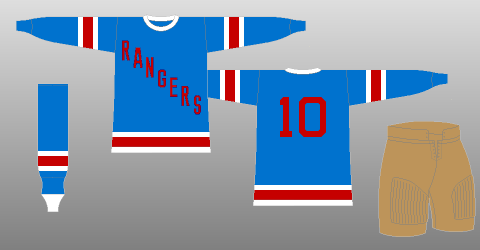 While doing research for this, I came to the conclusion that the light blue on the original jerseys is a myth, likely coming from two sources: one, an MSG program cover from that era in which the illustration shows a light blue Rangers jersey and two, a handful of black and white photos from that era which make the blue look very light in value, but which were likely the result of a lens filter usedto create a more desirable contrast in the image. I’ve yet to find physical evidence that they ever wore anything but their classic royal blue. Good to know about the lighter blue colour. 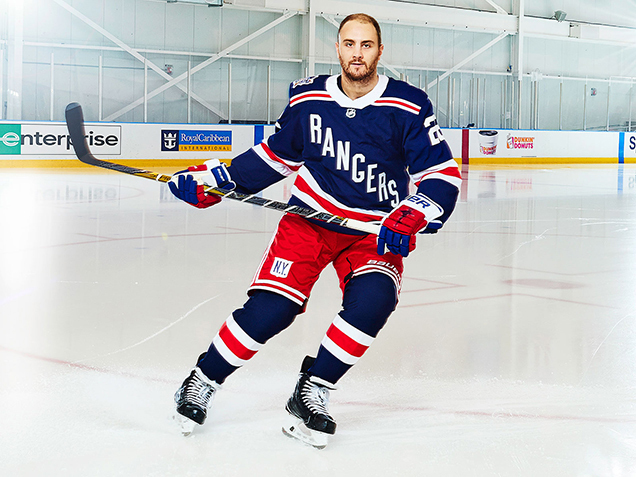 NHLuniforms.com (where I got the image from) has it much lighter. Chris Creamers doesn’t have that specific jersey on his site, but the logo on his site from that era is more of a navy blue. Those two are the ones I usually go to for a quick reference, but yeah, you could very well be correct. And glad you liked the review, much appreciated.